As our Blessed Mother stood gazing at the body of her Son, and saw the soldiers break the legs of the criminals on His right and left, she may have wondered what they were going to do to Jesus. As she looked on, she saw one of the soldiers drive a spear into His heart. She certainly felt the sharp pain of that piercing as she saw the cruelty continue. But what happened next was a sign that God’s mercy is abundant. Immediately, blood and water flowed forth from Jesus’ wounded Heart. Upon seeing this, our Blessed Mother would have immediately pondered its meaning. 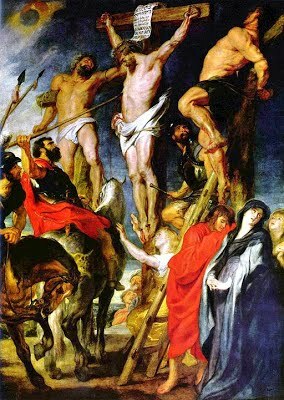 Why did blood and water gush forth from the wounded Heart of Jesus as He hung dead upon the Cross? The blood and water were symbols of the sacramental life of the Church. Even in death, as Jesus’ body was yet again abused by a soldier, He transformed the abuse into grace. As His Heart was pierced, He opened the floodgates of Heaven and poured forth an abundance of sacramental mercy. The blood was the pouring forth of the grace of the Most Holy Eucharist and the water was the pouring forth of the grace of Baptism. As our Blessed Mother looked on with love and deep sorrow, she may not have fully comprehended that this was the beginning of the sacramental life of the Church as we now understand it. She would have known, by faith, that she was witnessing the beginnings of the new life of grace won by her Son. She would have known that this final act of cruelty was being transformed before her very eyes and turned into abundant blessings from Heaven. What does your faith reveal to you about the Sacraments? Do you understand that the Sacraments are channels of the abundant mercy of God? Do you realize that the victory over sin and death, accomplished by Jesus on the Cross, flows to you by these seven streams of mercy? Do you understand the connection between this piercing of Jesus’ Heart on the Cross and the Church’s sacramental life? Reflect, today, upon the extraordinary grace of the Sacraments. As you ponder the blood and water gushing forth from Jesus’ side with our Blessed Mother, try to see this act in its deepest reality. See the grace of Baptism, the Holy Eucharist, and all the Sacraments at the moment of their birth. Ponder this: you stand before the Cross of our Lord; you bathe in His mercy; you see the flow from His wounded Heart; you accept it all. Hearing, you came. Coming, you saw. Seeing, you touched. And touching, you believed. His wounded Heart poured forth the Sacraments and you are invited to partake of the feast of grace. My dearest Mother Mary, as you stood, gazing with love at the dead body of your beloved Son, you saw the soldier open His Heart with a spear. Though this caused excruciating pain in your own heart, it also filled you with an abundance of hope. The hope that filled your heart came from the knowledge that this last act of cruelty toward your Son opened the grace of Heaven and poured forth an abundance of mercy. My dear Mother, pray for me that I may continually open my own heart to the mercy poured forth from the Heart of your beloved Son. May I especially be open to the grace given in abundance through the Sacraments. My merciful Jesus, even in death You were abused as Your Heart was pierced by the soldier’s lance. I thank You for the miraculous transformation of that act into the font of sacramental life within Your Church. I pray that I may always immerse myself in the mercy that gushed forth from Your divine Heart. May every drop of blood and water that poured forth from Your Heart land in my own soul.